Warman Gospel Church. Photo by Victor G. Wiebe. In 1944 four Neudorf families, Abram M. and Susan, David and Elizabeth, George and Elizabeth and Isaac and Anna Neudorf, plus Pete Harms met for Bible study in the Jake Neudorf home in the small village of Neuhorst, Saskatchewan. On Sundays they attended the nearby Chortitz Rudnerweider Mennonite Church. On Sunday evenings in 1945 they began a Jugendverein program in the Neuhorst village school and Sunday school in the Jake Neudorf home. The Rudnerweider ministers, including John D. Friesen, Jacob H. Peters, Henry Rempel and Henry Zacharias, assisted this group. By 1946 attendance increased mostly from people leaving the Old Colony Mennonite Conference so that a building for worship was needed. The Dalmeny Mennonite Brethren Church was purchased for $1,200 and moved to a one acre (0.40 ha.) site one quarter mile (0.40 km.) northeast of Neuhorst and dedicated on 28 July 1946 as the part of the Rudnerweider Gemeinde and named the Neuhorst Rudnerweider Church. In June 1947 Peter B. Peters was elected as minister and Abram M. Neudorf deacon. In 1948 John D. Friesen was called as Saskatchewan’s Rudnerweider Church minister, serving Neuhorst and other Rudnerweider congregations. In 1952 he was ordained as Saskatchewan’s Bishop. In 1951 Jacob H. Peters, a former pastor at Langham, Saskatchewan, was accepted as a Rudnerweider minister. Missions have been a prominent activity throughout the life of this congregation. In the early 1950s Henry Neudorf was ordained to serve in Africa with the Gospel Mission Union and Ben Wiebe with the West Indies Mission in Haiti. A further outreach was made in 1954 when Jake W. Neudorf was ordained to serve in Blue Wing, Saskatchewan, and 1956 with George Wiebe ordained for service in Mexico with the Gospel Mission Union. In 1959 the Rudnerweider Conference reorganized, including a name change to the Evangelical Mennonite Mission Conference (EMMC). Ministers in local congregations replaced the conference ministerial circuit. This is when Abram M. Neudorf was elected as minister for Neuhorst. In the 1950s a few couples affiliated with the Rudnerweider conference moved into the village of Warman, 9.1 km. south of Neuhorst, and with several other people began meeting under the name "Warman Interdenominational Mission." By 1964 it was clear that the village of Warman was a growing and vigorous community. Consequently the congregation moved its building to Warman and took the name Warman Gospel Church (EMMC). On the death of Abram M. Neudorf in 1966, Peter D. Friesen was elected minister, a role he filled until 1968 when Leonard and Ella Sawatzky, originally from Steinbach, Manitoba, became the pastoral couple. That same year the congregation made the transition from German to English. The Sawatzkys served for 12 years. In those years the old building was sold and new one built in its place. It was dedicated on 9 April 1978. Although the Sawatzkys left in June 1980, it was only in July 1981 that Warman Gospel Church was able to have Ron Dyck serve as their pastor. Unfortunately after one year Ron Dyck left, and again the congregation was without a pastor. In August 1983 Bill and Erma Neudorf assumed the role of pastor couple. Bill was the son of the congregation's founding pastor, Abram M. Neudorf, and had been a missionary in Germany with the Janz Team. The Neudorfs served until 1987. In November 1987 Terry Hiebert served as minister until 1995 when Greg and Benda Guarnett began as pastors and served for 11 years. In April 2007 Ed and Irene Martens were appointed interim pastors. Ed was the radio pastor of the Low German "Gospel Message" program and had been ordained in the Saskatchewan Bergthaler church. In an effort to encourage youth, Justin and Amber Hamilton were appointed as youth pastors in 2008 and continued until the summer of 2011. EMMC Recorder (May 1978): 16; (May 1984): 5. Heppner, Jack. Search for Renewal: the Story of the Rudnerweider/Evangelical Mennonite Mission Conference. 1987: 331-332. Neudorf, Nettie May. We Will Rejoice: the Story of Isaac and Anna Neudorf. 1980. Wiebe, Victor G. "Warman Gospel Church (Warman, Saskatchewan, Canada)." Global Anabaptist Mennonite Encyclopedia Online. April 2013. Web. 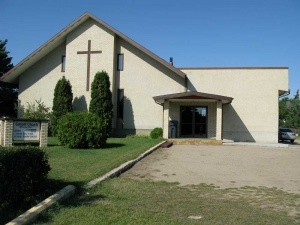 23 Apr 2019. http://gameo.org/index.php?title=Warman_Gospel_Church_(Warman,_Saskatchewan,_Canada)&oldid=140532. Wiebe, Victor G. (April 2013). Warman Gospel Church (Warman, Saskatchewan, Canada). Global Anabaptist Mennonite Encyclopedia Online. Retrieved 23 April 2019, from http://gameo.org/index.php?title=Warman_Gospel_Church_(Warman,_Saskatchewan,_Canada)&oldid=140532.